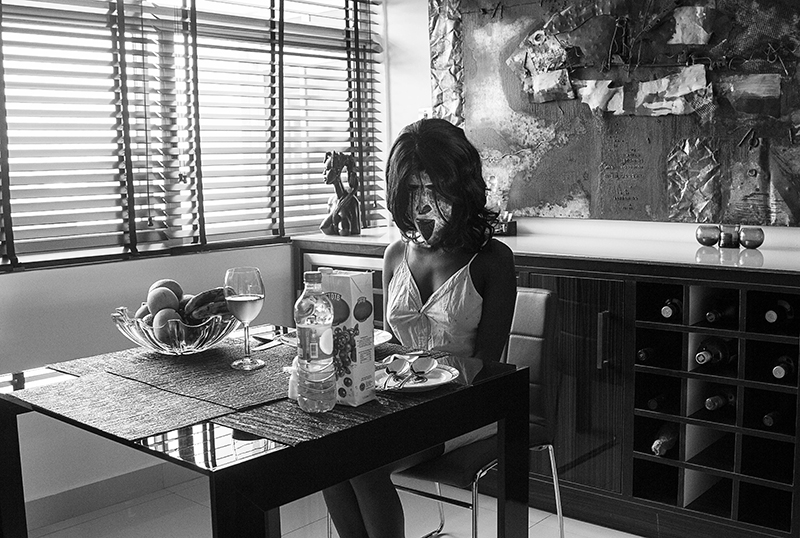 The Masked Woman | Exhibitors | LagosPhoto | International art festival of photography in Nigeria. The Masked Woman is a self-portrait series that explores representation of gender in Nigerian society through a performative lens. It attempts to avert the overarching male gaze by facing it head on with the artist’s own actions and choices. The images portray the solitary lifestyle of the “super femme-fatale” character, choosing to achieve pleasure and contentment through self-fulfillment that is not dictated by the subservient role as a house wife or defined through a man’s affection. While depicting a confident and sexually free woman, the subject’s mask and body language also suggest a nuanced tone of isolation which speaks to her stigmatization in a society that has limiting and strictly defined roles of what the proper woman should be. By diverting from the status-quo and exercising freedom of choice, such women are perceived as extreme, eccentric, and outside of polite society in Nigeria. The series personifies a growing number of independent, professional women in Nigeria who at once assert their autonomy while also being ostracized by cultural norms. Rather then waiting for the narrative to be told from the outside, the artist chose to adopt these roles in order to give birth to her own personal freedom, in the hope that it will inspire other woman in Nigeria to express their independence and free-will.